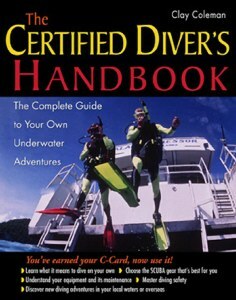 Here is the cover of The Certified Diver's Handbook as it was presented to me by the publisher. I pushed for the title, What Clay Say, but they wouldn't go for it. Some of the photos from the book are on this web site. The book is out NOW, so buy your copy NOW. You'll get a danged good book and I'll be able to fix the clutch on my old Mustang. "You won't find a more comprehensive, easy to read book about diving. This is a must-have for divers of all experience levels" Bonnie Cardone, former editor of Skin Diver magazine, editor of The Fireside Diver: An Anthology of Underwater Adventure. "Finally a book written by a diver who loves the sport and manages to get his message across in an entertaining way" Chuck Nicklin, cofounder of The Diving Locker, Emmy-award winning underwater cinematographer. "From masks to valve regulators, from rip tides to thermoclines, from fireworms to sharks--Clay overlooks nothing! You've never been through such a comprehensive course." Humberto Fontova, author, The Helldiver's Rodeo.